Most recent update: January 29, 2017 : This page is not written for or intended for use in legal endeavors. A similar review of post-traumatic vertigo is found here. Head injuries are sustained by 5% of the population annually. The incidence of hearing loss shortly after mild head trauma in the literature ranges from 7% to 50% (Fitzgerald, 1996). This range is very large, and we think, not to be relied upon. The literature suggests that recovery occurs in from 3-9 months in most individuals, but that symptoms persist for more than 1 year in 10 to 15%. Patients with head or neck injury may also have loud and disturbing tinnitus (Folmer and Griest, 2003; Segel et al, 2003). As the area injured is usually the ear, and the ear contains both hearing and vestibular apparatus, generally there are symptoms of both hearing disturbance AND dizziness at the same time, in post-traumatic hearing loss. Additionally, according to Ilan et al (2015), in a study of 3438 patients, olfactory (smell) dysfunction occurs in about 12% of patients with a work related head injury. Injuries from a fall were the commonest cause. In those with olfactory dysfunction, an associated skull fracture occurred in 37.1%. One wonders how clinicians can separate out real from feigned olfactory disturbance. One also wonders what the incidence is of visual disturbance such as retinal or vitreous detachment. In our experience, positional vertigo (BPPV) can follow a relatively minor head injury, including (for example) whiplash. Hearing loss or tinnitus generally requires a more major head injury. As noted above, smell disturbance also suggests a more significant head injury. As most of these (excepting BPPV) depend on largely subjective measures, the clinician must be careful to combine subjective and objective measurements when available. Fortunately, in BPPV, a specific nystagmus (jumping of the eyes) often makes the diagnosis very secure. Oddly, Scott et al (1999) suggested that head-trauma can cause hearing loss mimicking "4K notches" as seen in noise. We think that this association is unlikely to be valid. Location and severity of injury. Generally, but not always, the trauma is to the vicinity of the ear. Slaps to the ear, blunt objects hitting the around the bone of the ear are particularly common. In the author's experience, loss of consciousness is less common than retained consciousness. Falls with head contact to an unyielding surface, such as from a ladder to the floor, are more likely to be injurious than, for example, boxes falling on the head. Generally, although not always, in cases with post-traumatic dizziness or hearing loss there is signs of head injury -- a skull fracture being the most obvious, but also bruises, swelling, abrasions are seen in head injuries that are associated with hearing loss or tinnitus. A perforation of the ear drum is an unequivocal sign of a significant middle ear trauma. However, most of the time, the ear drum is not perforated (Grant et al, 2008). Generally, but not always, post-traumatic hearing symptoms begin immediately after the trauma. The main exception is the somewhat questionable entity, "delayed endolymphatic hydrop". Generally speaking, hearing sympoms get better with time. They rarely worsen after trauma, absent another injury (which can be medication related such as NSAIDs for pain). While not a significant source of hearing loss or smell disturbance, post-traumatic migraine may also begin a few days later after a head injury. Pain medications given for bodily injuries can cause tinnitus and occasional hearing loss (e.g. nonsteroidals). Antibiotics given for trauma related infections, such as gentamicin or vancomycin, are sometimes ototoxic. Depression and anxiety are very common after work disruption and the legal endeavors that often accompany trauma. Exaggeration of hearing symptoms is also common in persons who are undergoing litigation related to a head injury, as due to the litigation process, they may have secondary gain. In other words, there is a possibility of being paid for reporting more symptoms. The clinician must separate out reasonable and documented impairment from unreasonable and potentially amplified impairment. Someone who is exaggerating their symptoms, may still have an objective nystagmus or hearing disturbance. In situations like this however, the credibility of the person reporting other symptoms becomes lower. There are many methods of separating out feigned hearing symptoms from objective deficits. Rather straightforward ones involve comparing claimed hearing function (i.e. audiometry) with a measure that does not require any cooperation (such as OAEs, evoked potential tests, or acoustic reflexes). It is almost impossible to "fool" an audiologist who is checking for a feigned hearing loss. After a head injury, eardrum or ossicular chain damage, disruptions of intralabyrinthine fluid, cochlea, or 8th nerve may be damaged resulting in hearing loss. Tinnitus can also result from neck injury. It is helpful to divide hearing loss according to the location of injury (see above). Conductive hearing loss -- damage to ear drum or ossicular chain. Disruption to the ear drum or ossicular chain can cause conductive hearing loss. This means that hearing is better through bone than air. When the ear drum is perforated but ossicles remain attached the the reminant, hearing is reduced for air condition. Disruption to the ossicular chain -- the tiny bones between the ear drum and inner ear, can cause nearly complete hearing loss. Blood or fluid within the middle ear can reduce hearing. According to Grant et al (2008), most conductive hearing loss are "closed", meaning that the TM is not perforated. The remaining types are hemotympanum (blood in the middle ear), and perforation. 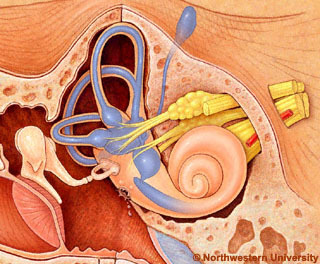 Most patients with tympanic membrane perforations have pure conductive hearing loss. This is also true for hemotympanum (i.e. blood behind ear drum). Patients with closed post-traumatic conductive hearing loss, have roughly equal fractions of mixed and conductive hearing loss. Round window fistula. 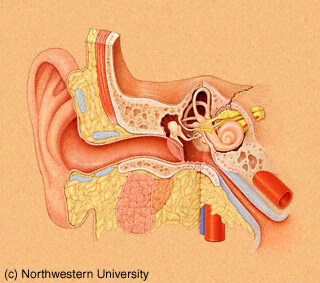 A membrane "blows out" between the inner and middle ear, causing dizziness and possibly also hearing loss. Perilymph fistula. Usually symptoms of imbalance and dizziness provoked by straining or blowing the nose. People with fistula may also get dizzy with loud noises (called Tullio's phenomenon). The frequency to which this syndrome occurs is controversial, but general opinion holds that it is rare. Post-traumatic Meniere's syndrome --Also sometimes called "hydrops". Episodes of dizziness accompanied by noises in the ear, fullness, or hearing changes. Mechanism thought to be bleeding into inner ear, followed by disturbance of fluid transport. Onset of symptoms may vary from immediate to as long as one year later. There are frequently legal implications to this diagnosis. The probability of Menieres being reasonably attributed to post-traumatic mechanisms is a function of the severity of injury (severe makes more likely), the latency from the injury (longer is less likely), the presence of a pre-existing condition, and the presence of secondary gain. Persons with the Large Vestibular Aqueduct syndrome are felt to be more likely to develop these symptoms after head injury (Berettini et al, 2000). However, this is somewhat controversial and furthemore, LVAS is extremely rare. Airbag injuries and blast injuries. These are thought to be due to very loud noise. There is a significant incidence of vertigo and hearing disturbance after airbag deployment (Yaremchuck and Dobie RA. 2000). Labyrinthine "concussion". Defined as a non-persistent hearing or labyrinthine disturbance which follows a head injury, not caused by another mechanism. This page has more about this condition. The term "cochlear concussion", is used in a similar way to "labyrinthine concussion", but it applies to situations where hearing is affected, but vestibular function is not. So it is basically a "labyrinthine concussion", minus the vestibular component. Recent advances in diagnostics for cochlear injury, especially sweep OAE, have made it far more difficult to miss cochlear damage (given that a high resolution device is used). Furthermore, given the advent of more sensitive methods of detecting labyrinthine damage, such as VEMPs and video-frenzels, it is more difficult to find these cases (as it is less common to have a lack of evidence for a vestibular component). The 8th nerve is hard to damage as it is encased in hard bone. Neural hearing loss is due to damage to the 8th nerve, such as due to temporal bone fracture, or traction on the nerve between the lip of the IAC and brain. Temporal bone fracture (T-bone fx). Severe dizziness after the injury, with skull or temporal bone CT scan indicating a fracture. This is often accompanied by hearing loss or peripheral facial weakness ( Bell's Palsy). Temporal bone fractures, especially the oblique variety (see above), may impair hearing and cause dizziness. There often is blood seen behind the ear-drum (hemotympanum). Either a conductive or sensorineural hearing loss may be present. Vestibular deficits are also common, especially in the oblique variety. Bilateral vestibular problems are exceedingly rare. Treatment is conservative. Prophylactic antibiotics are given, usually for 4 weeks. Myringotomy and insertion of a ventilation tube may be indicated, especially for serious otitis that persists after one month (Pulek and Deguine, 2001). Fistulae between the inner ear and surrounding spaces can occur in T-bone fracture. In this instance, air may be seen within the labyrinth on CT ("pneumolabyrinth). This is exceedingly rare. Fluid may also be seen within the mastoid sinus. It is rare that there is a preexisting MRI or CT scan that can clearly related fluid to temporal proximity. Hearing loss from damage to the brain or brainstem is rare, and post-traumatic hearing loss localized to these sites is exceedingly rare. The reason for this is that hearing pathways are redundant, quickly become bilateral in the brainstem on their way to the brain. Generally speaking, one must "take out" both sides of the hearing circuitry in the brainstem or brain, to cause a lasting injury. This is rare and should not be anywhere near your first thought when you encounter hearing loss after a head injury. As the neck is relatively far from the inner ear, one would not expect hearing loss after injury to the neck. Nevertheless, there are a few reports (e.g. Segal et al, 2003) of hearing loss associated with (note we are not saying caused by) neck injury. Segel et al reported an amazing hearing loss prevalence of 51.5% in 117 patients with blunt neck trauma. As there was no "before-after" comparison, it may be that these patients had pre-existing hearing loss, that was detected for the first time after their trauma. If one accepts that a small number of these patients truly did have hearing loss caused by their injury (we think skepticism is in order here), one possible explanation is that the neck injury was accompanied by an ear injry. Other theories include neuromuscular, neurovascular, or vertebral artery injury. One would also think that CSF leak from a dural root sleeve tear would be a reasonable mechanism. As litigation is common post whiplash injury, it seems possible that malingering also contributes. More about neck injuries and ear symptoms is found here. First the doctor will want to know exactly when and how the head or neck was injured, and the character of the symptoms. Was there dizziness (i.e. spinning ? unsteadiness ? confusion ?). He/she will want to know if you were unconcious and the duration of time. Did the airbag deploy ? All available records from the emergency room or hospital where you were seen after the injury should be obtained and shown to your doctor. This is especially important when there is litigation as much may depend on small details. As there is often hearing disturbance and dizziness combined, examination for both should be performed. Audiometry should be done in all. We also favor sweep OAE testing. In patients with hearing disturbance, an "ECochG" may be done. Next, a specialized examination for dizziness will be performed. A good screening test for dizziness is to use video-frenzel goggles, such as we use at Chicago Dizziness and Hearing. Balance will be measured, often with moving platform posturography. A search for "nystagmus" will be made, related to head and/or neck position or to vibration of the neck. You may be checked for pressure sensitivity with the fistula test. Should there be dizziness, laboratory tests will be ordered. In most instances these will include an ENG, and rotatory chair test. A VHIT may also be available. An MRI scan or CT scan of the inner ear (temporal bone CT scan) is usually performed. If available, a VEMP may be useful. An EEG may be obtained for persons with paroxysmal cognitive symptoms suggestive of epilepsy. Moving platform posturography is helpful to quantify balance deficits. An MRI of the neck can be helpful to establish the extent of neck injury. Psychological testing is sometimes done in persons with head trauma and hearing/vertigo symptoms that were reported in close temporal proximity. Most often this is performed in persons with normal test results, but in whom there are cognitive disturbances after the head injury. The "Impact" test is particularly useful as it is inexpensive, can be performed in a serial fashion, and is resistant to bias. Psychologial tests can document interactions between symptoms and personality as well as cognitive difficulties. Such testing is often useful in sorting out the situation when patients are in litigation and could benefit from an appearence of ill health, or who have anxiety or depression related to life disturbance post trauma. Treatment is individualized to the diagnosis. Treatment usually includes a combination of hearing assistive devices, medication, and counseling about prognosis. Occasionally, surgery may be recommended. Feneley, M. R. and P. Murthy (1994). "Acute bilateral vestibulo-cochlear dysfunction following occipital fracture." J Laryngol Otol 108(1): 54-6. Fitzgerald, D. C. (1996). "Head trauma: hearing loss and dizziness." J Trauma 40(3): 488-496. Genarelli and others. Diffuse axonal injury and traumatic coma in the primate. Ann Neurol 1982:12:564-574. Grant, J. R., J. Arganbright, et al. (2008). "Outcomes for conservative management of traumatic conductive hearing loss." Otol Neurotol 29(3): 344-349. Practice parameter: The management of concussion in sports (summary statement). Report of the Quality Standards Subcommittee. Scott, A. M., et al. (1999). "Head trauma and mid-frequency hearing loss." Am J Audiol 8(2): 101-105. Segal, S., et al. (2003). "Hearing loss after direct blunt neck trauma." Otol Neurotol 24(5): 734-737. Tjell C, tenenbaum A, Rosenhall U. Auditory function in whiplash-associated disorders. Scand Audiol 1999,28(4) 203-9. YAREMCHUK K, Dobie RA. Otologic injuries from airbag deployment. Otolaryngol Head Neck Surg 2001; 125: 130-4.